Spinach Soup, Tomato Soup and many other clear soups are very famous and we often turn to them when we are looking for a hot bowl of soup. This section is an effort to include more variety in your diet while piling up some protein as well. Pulses and Legumes can be put to use to create delicacies like Rajma and Spinach Soup, Moong Soup, Lentil and Vegetable Broth and many more. While in soups like Mushroom Soup and Cream of Celery Soup, the protein content is enhanced by the addition of milk. To your surprise we have also used protein packed nuts like almonds and paired them with broccoli to make Broccoli and Almond Soup. 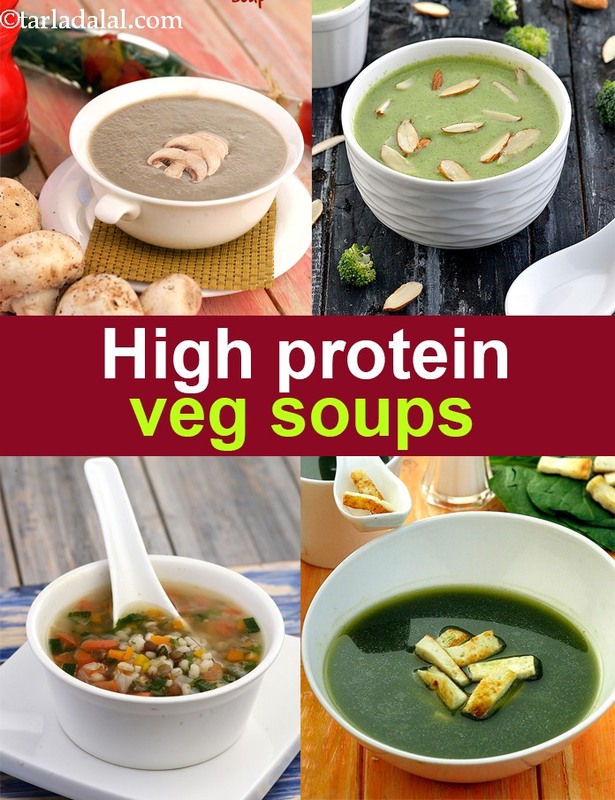 These soups apart from lending protein to your diet, also are a good source of calcium and both these nutrients together pair up to build strong bones and aid in the growth of cell membrane.